Example of earrings finished from kit. One of my own designs and a best seller – now in kit form. Make your own(MYO)…or I will make them for you…your choice. Kits are $18.00 / Finished Earrings $30.00. 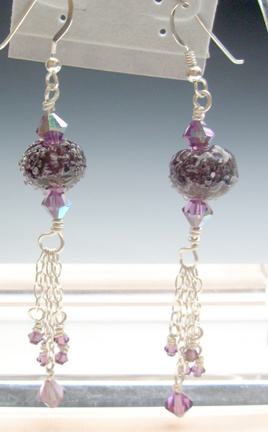 Everything included: 2 of my “sugar” beads, 6 – 6mm crystals, 8 – 3 mm crystals, Figaro chain (note cable chain used in the sample), sterling wire 20 g., earring findings and directions. For a skilled wire worker, these should take under 30 minutes to make. One available each color except hot pink. I will also make them to order.